Nearby Moku ʻUmeʻume (Ford Island) provided pili grass for house thatching. Ewa’s house builders gathered their pili grass for house thatching here until the time came when foreign shingles were introduced, then thatching was discontinued. It was also covered with kiawe trees; it was noted that the kiawe forests there and the Honouliuli region supplied much of the fuel for kitchen fires in Honolulu. James Campbell, who arrived in Hawaiʻi in 1850, ended up in Lāhainā and started a sugar plantation there in 1860 (later known as Pioneer Mill.) 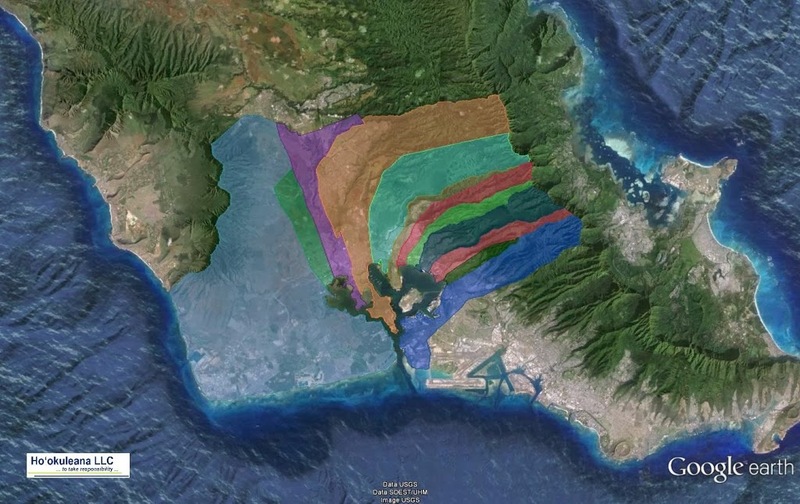 He also started to acquire lands in Oʻahu, Maui and the island of Hawaiʻi. In 1876, he purchased approximately 15,000-acres at Kahuku on the northernmost tip of Oʻahu from HA Widemann and Julius L Richardson. In 1877, he acquired from John Coney 41,000-acres of ranch land at Honouliuli. Many critics scoffed at the doubtful value of his Honouliuli purchase. But Campbell envisioned supplying the arid area with water and commissioned California well-driller James Ashley to drill a well on his Honouliuli Ranch. In 1879, Ashley drilled Hawaiʻi’s first artesian well; James Campbell’s vision had made it possible for Hawaiʻi’s people to grow sugar cane on the dry lands of the ʻEwa Plain. When the first well came in at Honouliuli the Hawaiians named it “Waianiani” (crystal waters.) (Nellist) The ʻEwa Plain has been irrigated with ground water since 1890. By 1930, Ewa Plantation had drilled 70 artesian wells to irrigate cane lands; more were drilled later. It was some years after the first artesian wells were brought in before there was a general understanding of the formation of the coastal caprock and its vital importance in the creation and functioning of the artesian reservoirs. In 1889, Campbell leased about 40,000-acres of land for fifty years to BF Dillingham (of Oʻahu Railway and Land Co;) after several assignments and sub-leases, about 7,860-acres of Campbell land ended up with Ewa Planation. By 1923, Ewa Plantation was the first sugar company in the world to raise ten tons of sugar per acre and, by 1933, the plantation produced over 61,000-tons of sugar a year. Ewa Plantation was considered one of the most prosperous plantations in Hawaiʻi and in 1931 a new 50-year lease was executed, completing the agreement with Oʻahu Railway and Land Company and beginning an association with Campbell Estate. By 1936, ʻEwa Plantation Company was the first plantation to have a fully mechanized harvesting operation and by 1946 tests were made to convert the hauling of cane from railroads to large trucks. During WWII, Japanese Americans were put in internment camps in at least eight locations on Hawaiʻi; one of those sites was at Honouliuli Gulch. The forced removal of these individuals began a nearly four-year odyssey to a series of camps in Hawaiʻi and on the continental United States. They were put in these camps, not because they had been tried and found guilty of something, but because either they or their parents or ancestors were from Japan and, as such, they were deemed a “threat” to national security. When James Campbell died on April 21, 1900, the Estate of James Campbell was created as a private trust to administer his assets for the benefit of his heirs (in 2007, the James Campbell Company succeeded the Estate of James Campbell.) The Estate played a pivotal role in Hawaiʻi history, from the growth of sugar plantations to the growing new City of Kapolei. 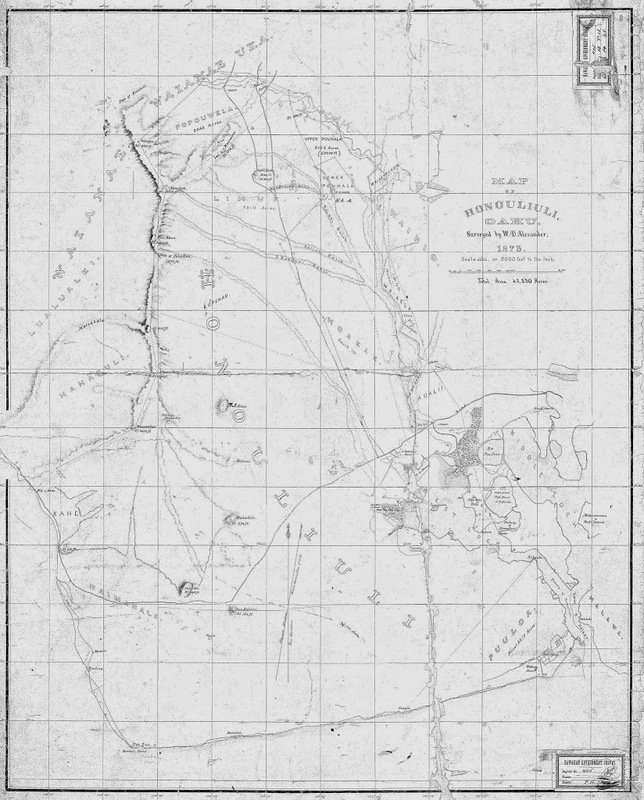 The image shows an early (1873) map of Honouliuli (DAGS.) In addition, I have included other related images in a folder of like name in the Photos section on my Facebook and Google+ pages.